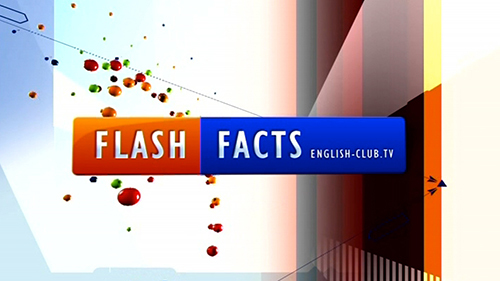 Flash Facts is a unique series of episodes presented on English Club TV. Viewers can learn to speak English whilst learning interesting facts about the world around them. Subject matter varies, but the fact is the host delivers each point clearly and concisely. Viewers can observe visual representations of the content and be able to test themselves on their listening skills. Also included is a handy pdf format downloadable text file that includes all the points discussed on each episode. Those interested in learning new and exciting trivia and facts will also learn to speak English fluently. Flash Facts delivers precisely what viewers look for in learning to speak English. The etymology of widespread international words and many more. Learn the original meanings of some international words. Learn who laid the foundation stone to Volkswagen plant. Find out the real name of the revolver inventor! How many eyes do scorpions have?